I do a lot of my reading on the forum from my Iphone. Starting in the last day or so I get a pop up EVERY TIME a new page opens that wants me to use the app Forum Runner to view Steves. It is very annoying to continue canceling the pop up. I am assuming that this is coming from the Iphone app store is some way but have not figured out how to block it. Any ideas? I don't know how to block it. 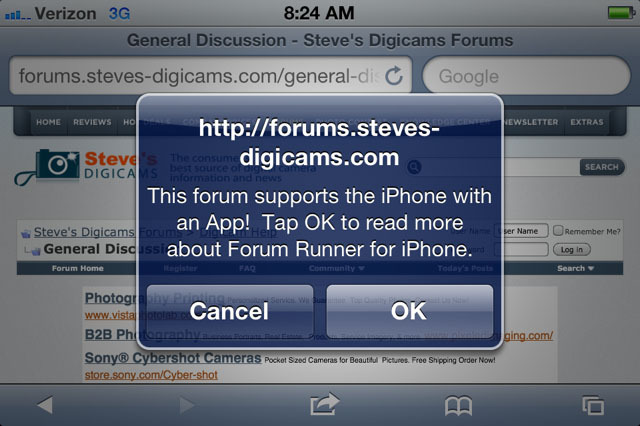 But, the forums here at http://forums.steves-digicams.com were recently added to Forum Runner. They have a free version of it that's read only (and a premium version for $1.99 with more features , including the ability to post, upload images, and more). So, I've installed it on my phone (running Android 2.3) to make it easier to read forum posts here; and you may want to do the same thing on your iPhone (as it supports both IOS and Android devices). When you first install and start Forum Runner, if you use the Browse Forums Feature, you'll find Steve's Digicams under Art>Photography (when browsing through the Art>Photography list, just use the "More Forums" choice at the bottom of each page, and you'll find us as the last entry on the last page in that section right now, since we're the most recent site added to it). Then, you can add Steve's to your Forum Runner Favorites to make it easier to get to (when browsing Steve's Digicams Forums with Forum Runner, click on Settings and you'll see a choice to make it a Favorite). They also offer a Forum Runner Premium version for $1.99 with full posting options, forum search, support for thread subscriptions / private messages, posting of images, saving of pictures, push notification support for threads and more. I can't replicate your problem on my iPhone. I got the pop-up on the first load of the forums, but only once. All other pages I load don't have the pop-up. I also tried closing out the browser and reloading, but didn't get anything. Can you tell me what version of the iOS are are using so we can kick it back to tech? I can't imagine that it's supposed to appear on every single page load, probably just the first time you visit the forums on mobile.